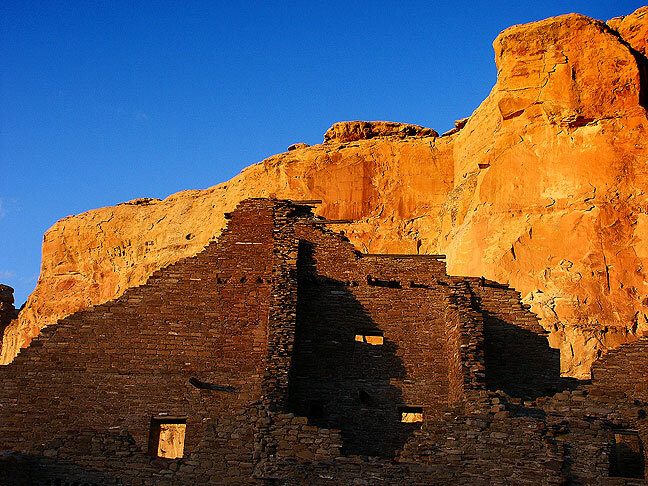 Last light falls on the canyon walls near Pueblo Bonito Great House at Chaco Culture National Historical Park. 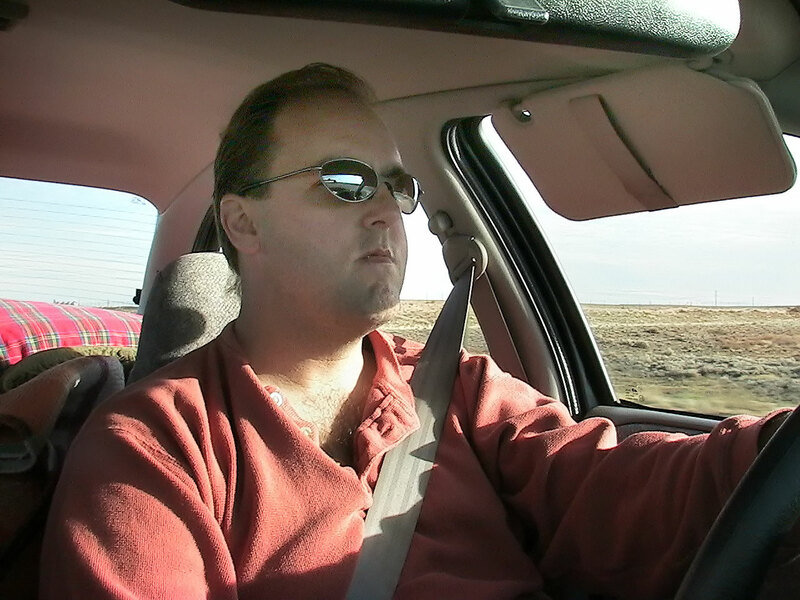 David drives his Saturn on Interstate 40 on our way to New Mexico. I drove to Norman, Oklahoma and loaded in David Martin‘s Saturn. We got an early start. As usual, we drove through gloomy weather until we hit the New Mexico border, where the clouds parted. Forecasts for our destination indicated a slight chance of rain. The “Mohedrus” was our nickname for a sign at El Comedor steak house in Moriarty, New Mexico. 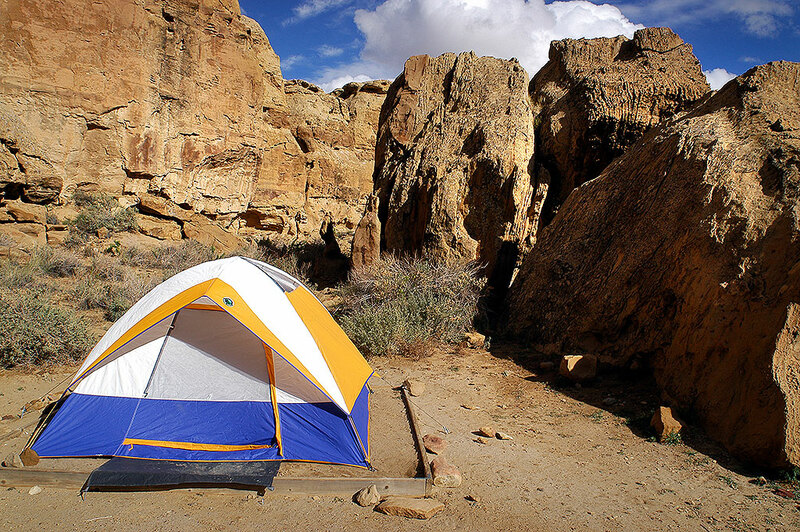 We camped for two nights at Chaco’s Gallo Campground. 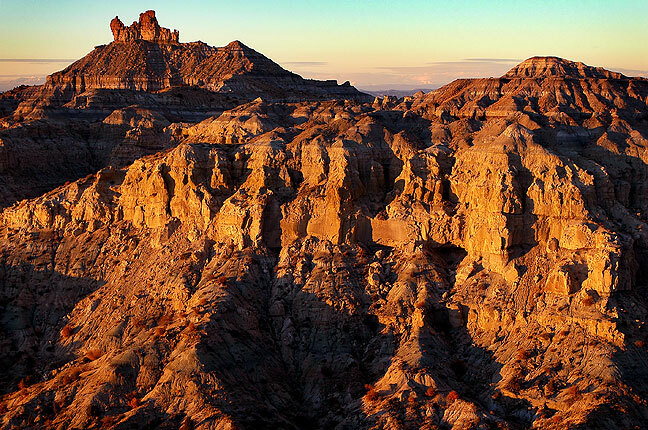 This view looks south from the cliff above our Gallo Campground camp site. 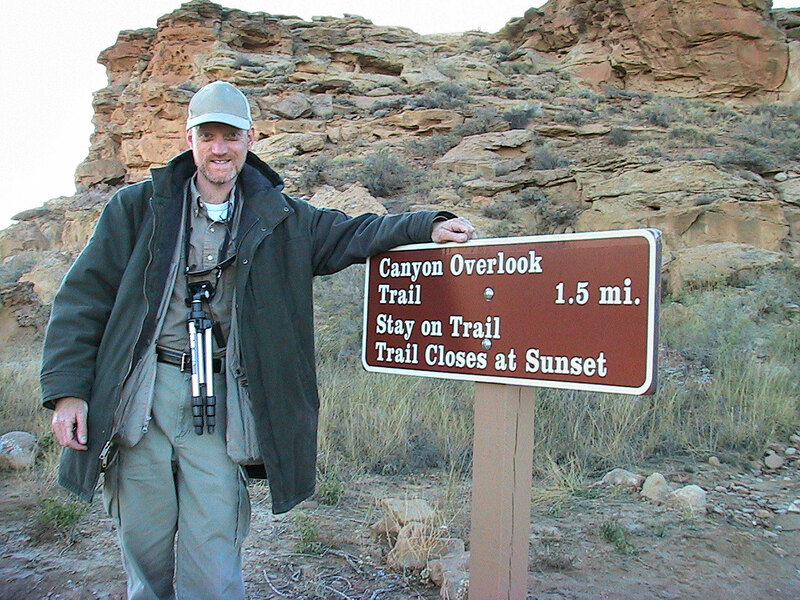 The author poses at the sign for the Canyon Overlook Trail, one of the shorter trails at Chaco Canyon. 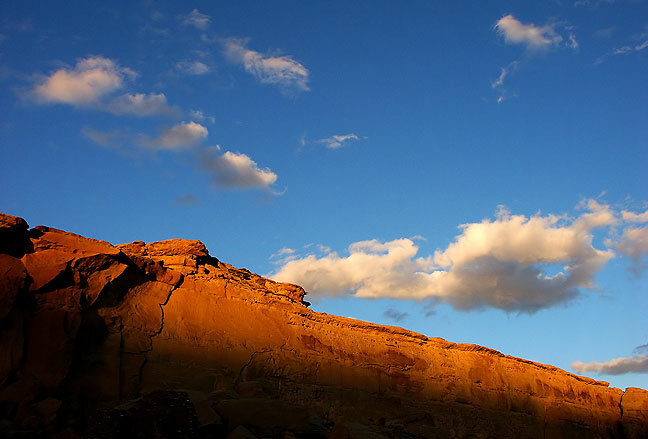 We made camp before dark, then hiked the Chaco Canyon Overlook Trail for a brief sunset image. We made a huge fire and huddled around it for more than two hours. 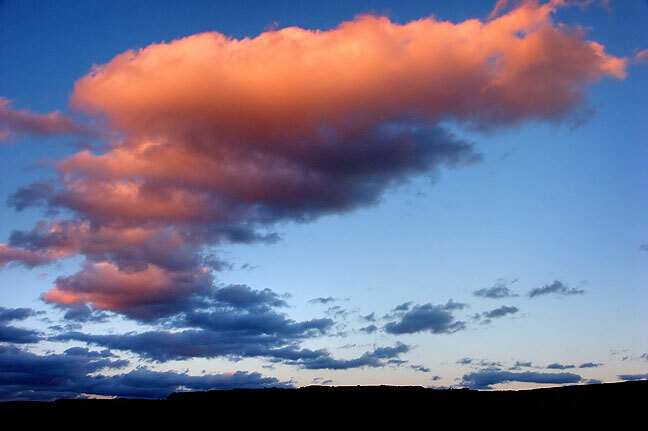 I spotted this evolving afternoon sky during our first night at Gallo Campground. 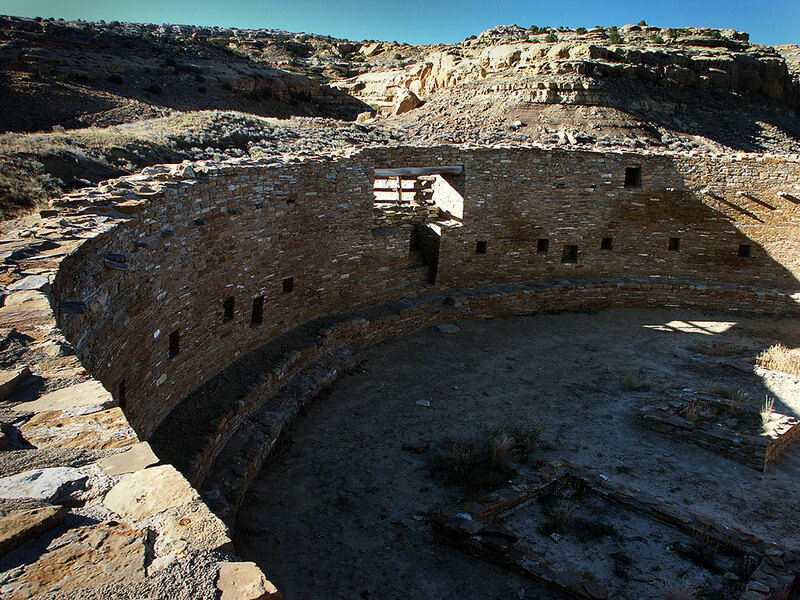 This very large ring cairn was constructed at the top of the cliff about the campground on the Chaco Canyon Overlook Trail. 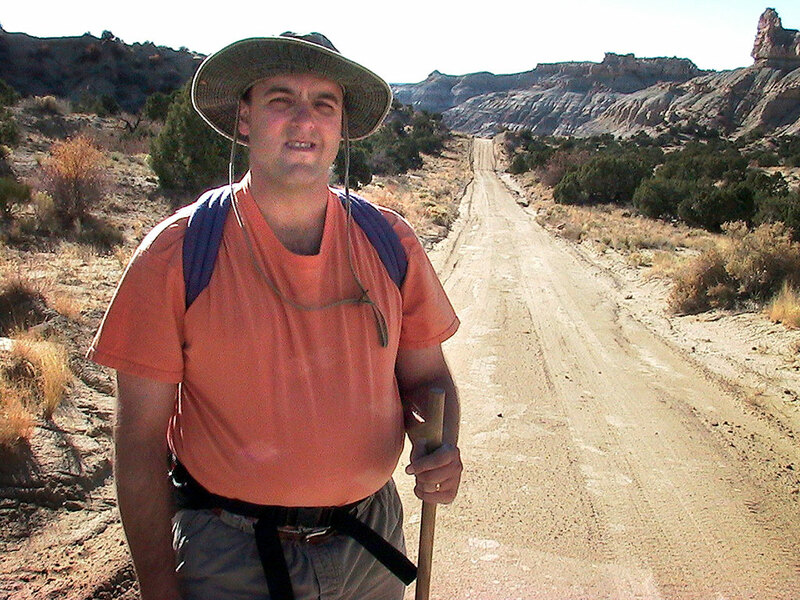 David takes a moment to pose near the end of the Chaco Canyon Overlook Trail. 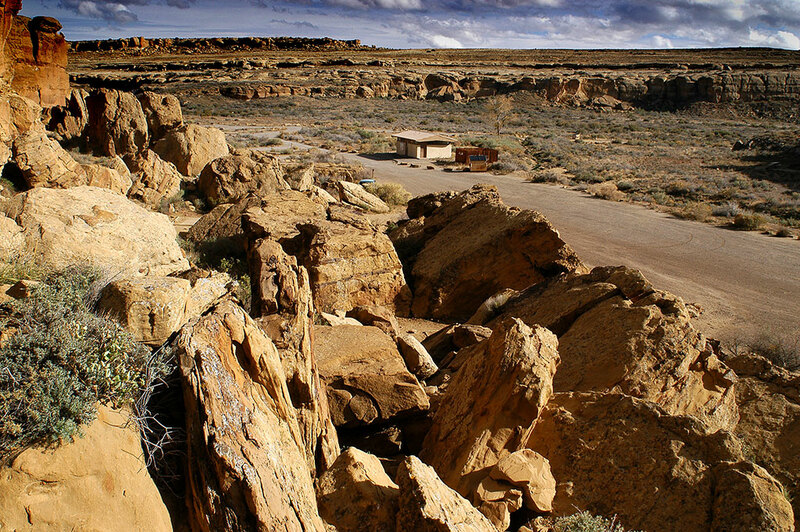 Fajada Butte is visible from the Chaco Canyon Overlook trail. 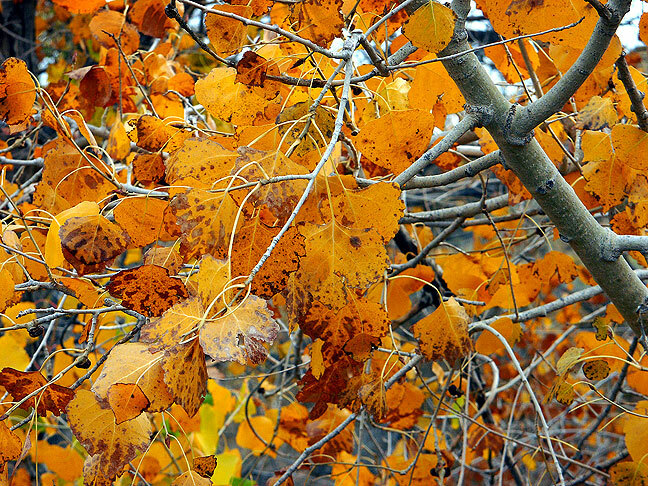 Deep yellow hues decorated trees in Chaco Wash as we made our way to Peñasco Blanco Great House. It rained off and on all night, but was dry by morning. 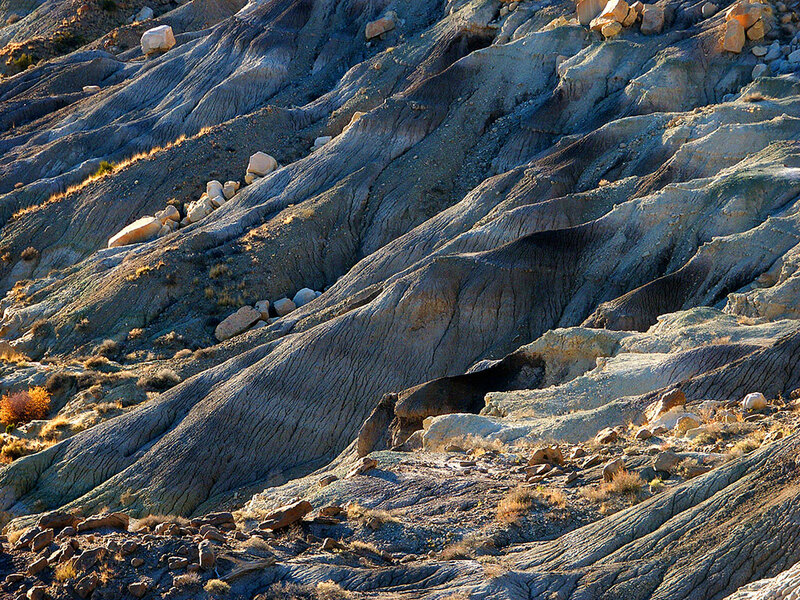 We hiked the Peñasco Blanco Trail, the longest in the canyon, in the morning, in some very unusual light, with a cold wind swirling around us. The trail took us past the Casa Chiquita great house. 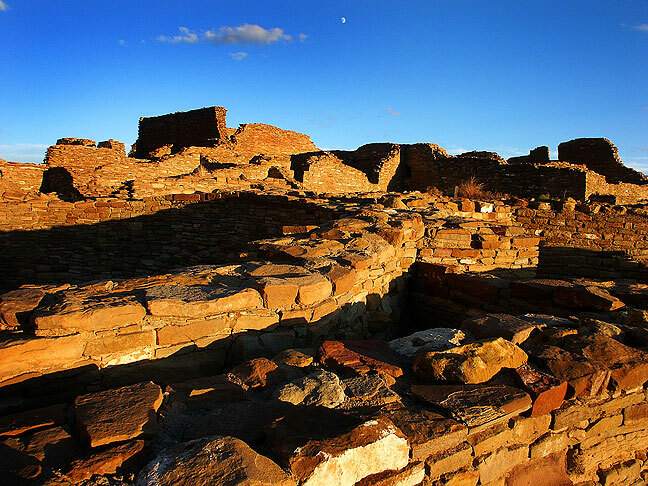 Peñasco Blanco is an outlier of the main Chacoan community. 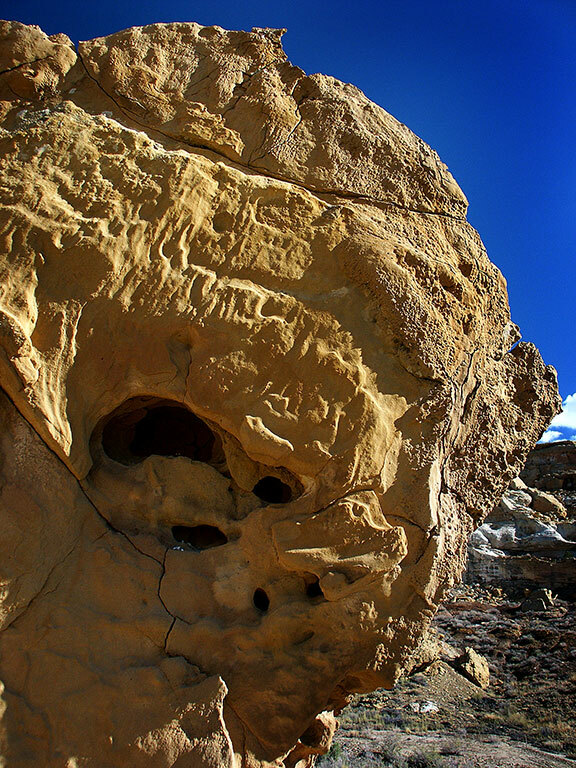 The canyon wall on the Peñasco Blanca trail included pictographs and Cliff Swallow nests. With cloudy skies and subdued light, I chose to shoot several items, like this masonry at Casa Chiquita great house, in black and white. 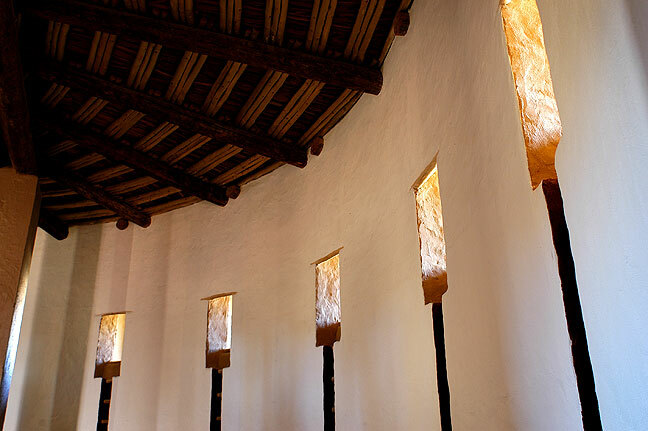 Cold light streams through a masonry window at the Peñasco Blanco Great House at Chaco Canyon. 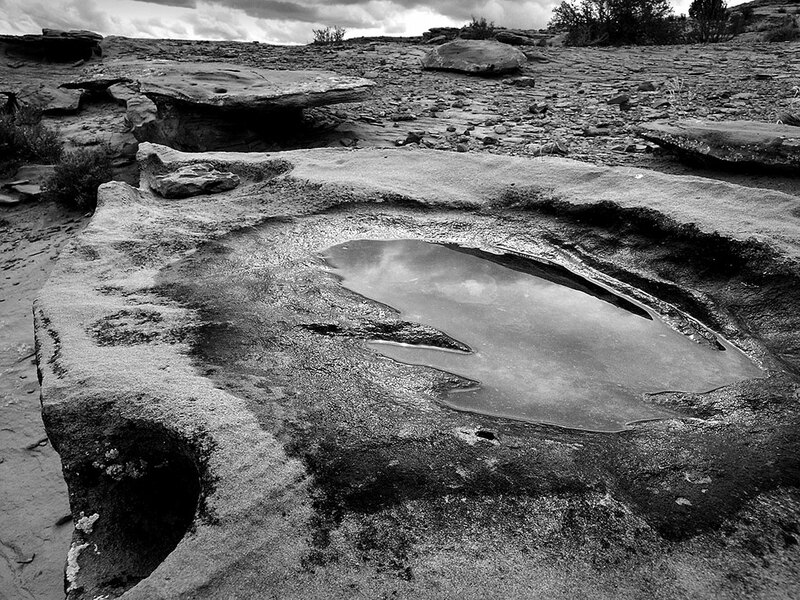 I photographed this puddle and sandstone formations near the Peñasco Blanco Great House at Chaco Canyon. 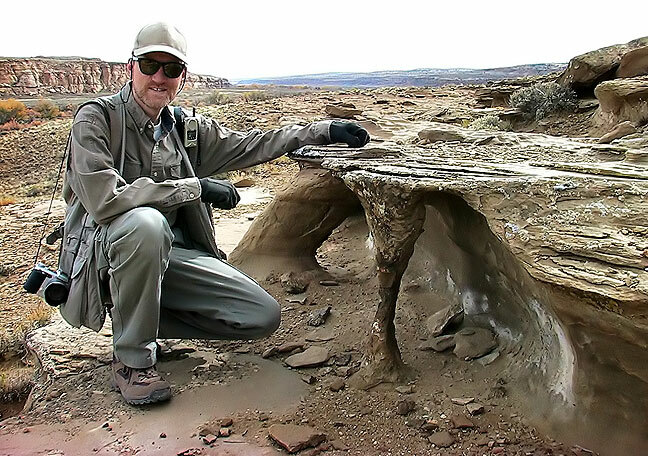 The author poses with some arch-like formations long the Tsin Kletsin trail on South Mesa at Chaco Canyon. 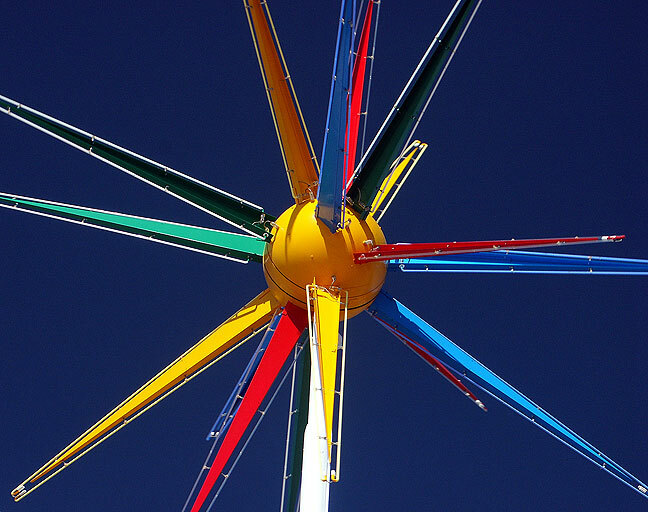 A spur trail took us to the famous Supernova Platograph, which is believed to represent the sighting of the Crab Supernova of July 5, 1054, which was also recorded by Chinese and Arab astronomers, and may have been visible during daylight hours for many days after it occurred. 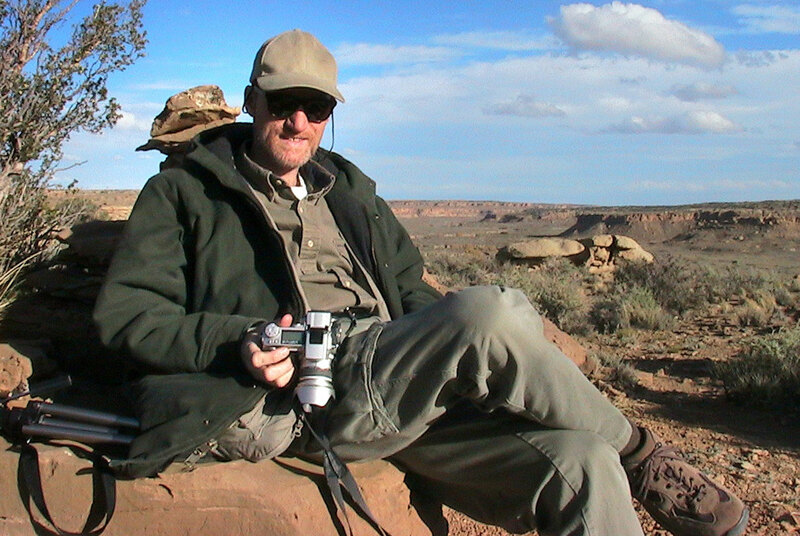 Your host sits on a boulder to enjoy sunset at Chaco’s Canyon Overlook Trail. 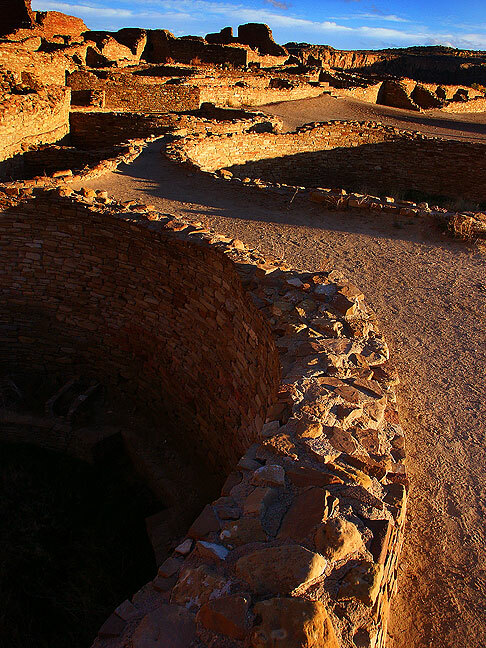 We took another hike to the Canyon Overlook, then drove to last Pueblo Bonito to photograph the sunset on the ruins. 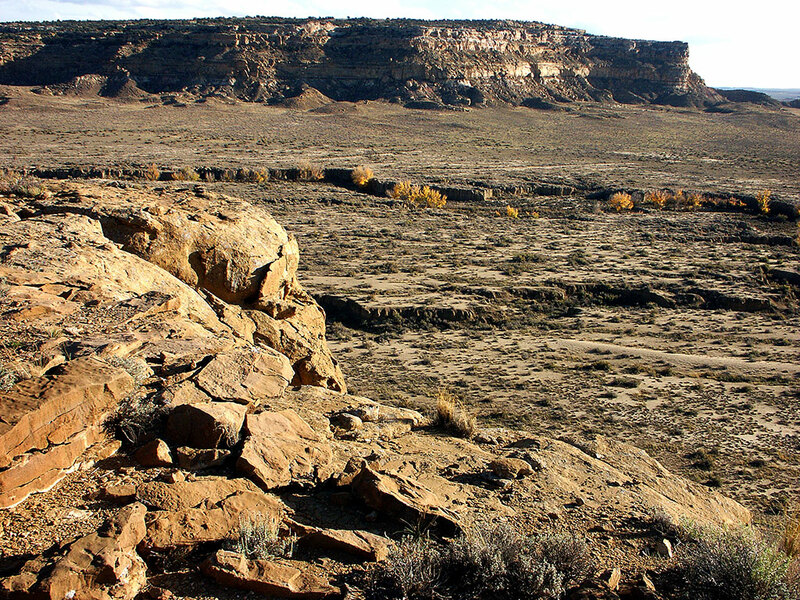 This view shows Chacra Mesa and Gallo Wash from Chaco Canyon Overlook trail. 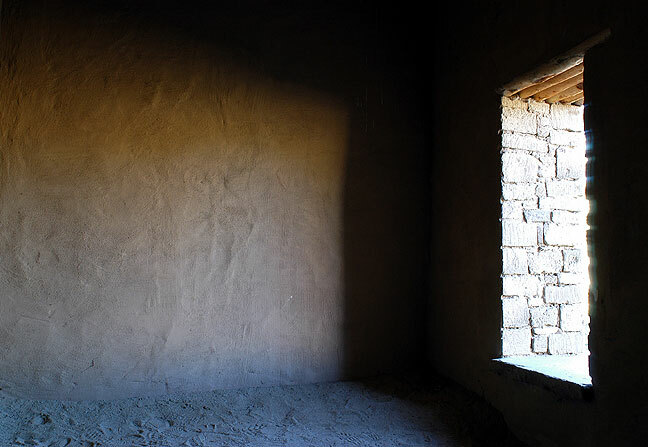 Shadow falls on back walls of Pueblo Bonito. 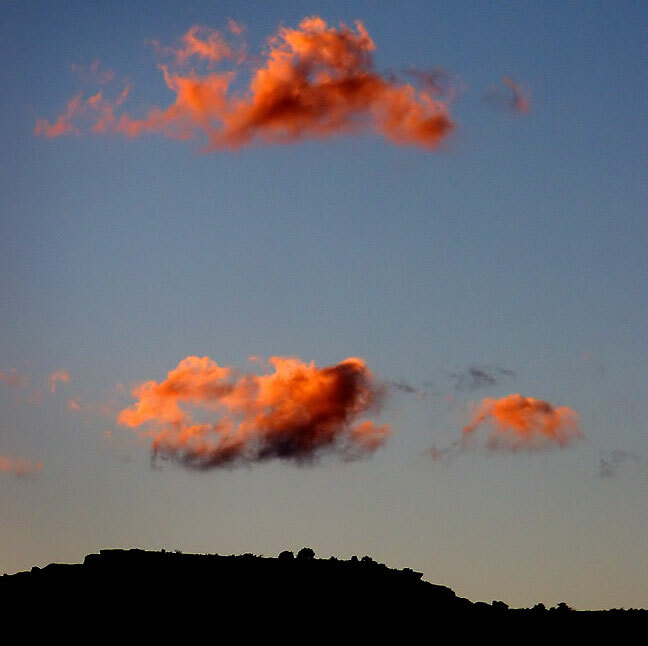 I shot these clouds and cliff looking west about 15 minutes after sunset at Chaco. 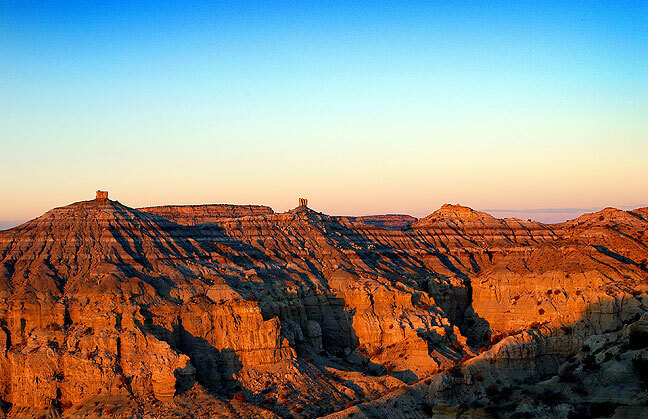 The Chaco sunset continued to evolve dramatically and elegantly. 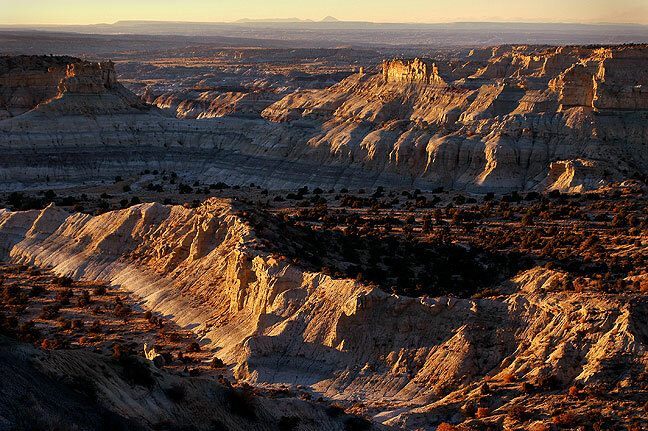 The signature formation of Chaco Canyon, Fajada Butte, and a cold desert sky after sunset, are visible in this view made near the Visitor Center. The night at Gallo Campground was very cold. David poses at the top of the canyon rim above Casa Rinconada. 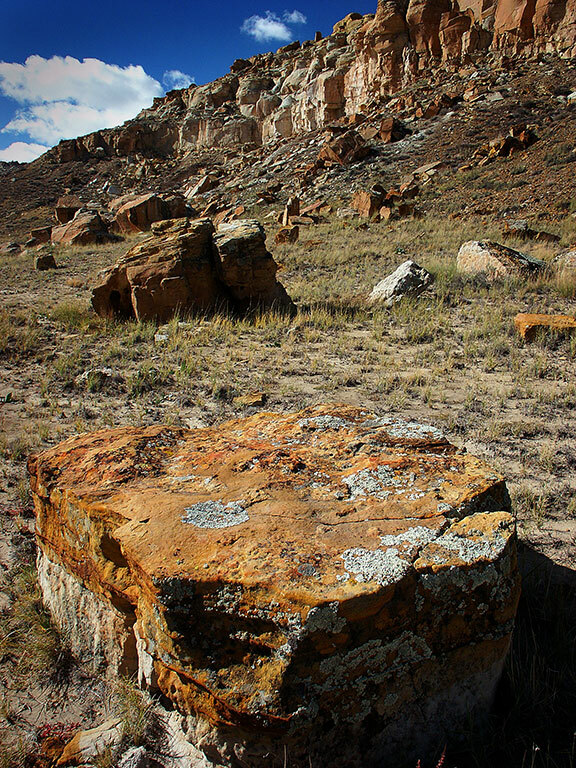 Pearl blue skies and bright sun greeted us for this morning’s hike to Tsin Kletsin, one of the best in the canyon. We made the loop, starting at Casa Rinconada, and returning via the south gap. 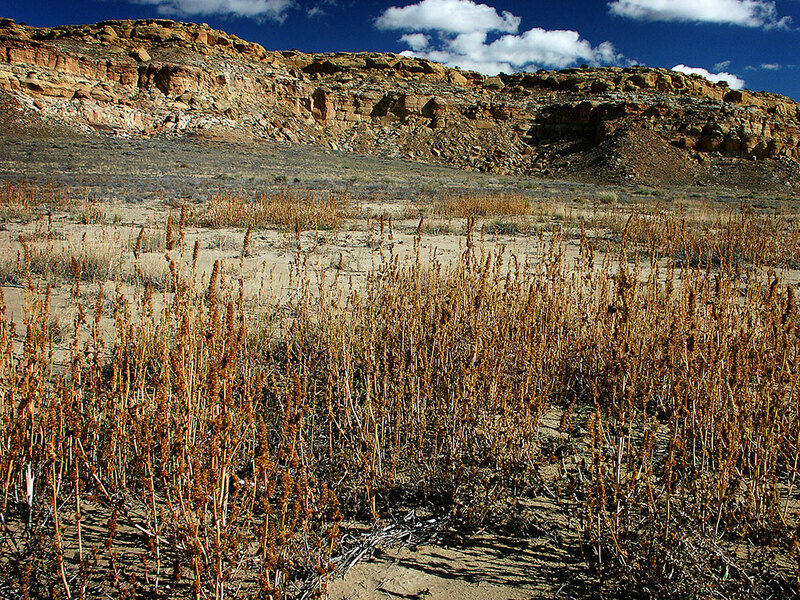 After lunch we broke camp, then hiked Wijiji, one of the lonelier trails in the canyon, under perfectly blue skies. 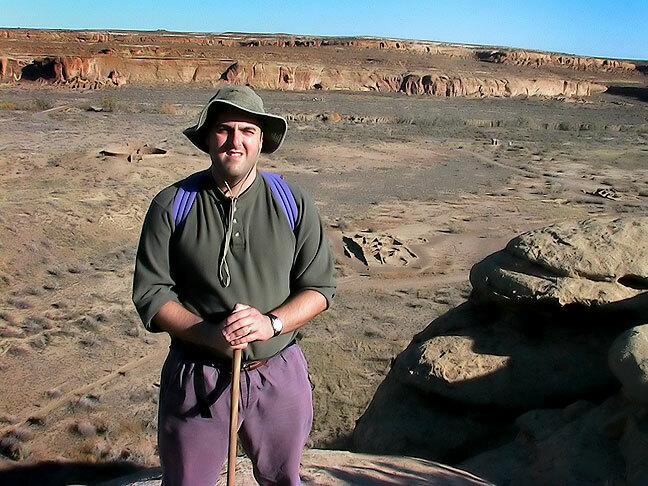 I have now hiked every trail in Chaco Canyon. 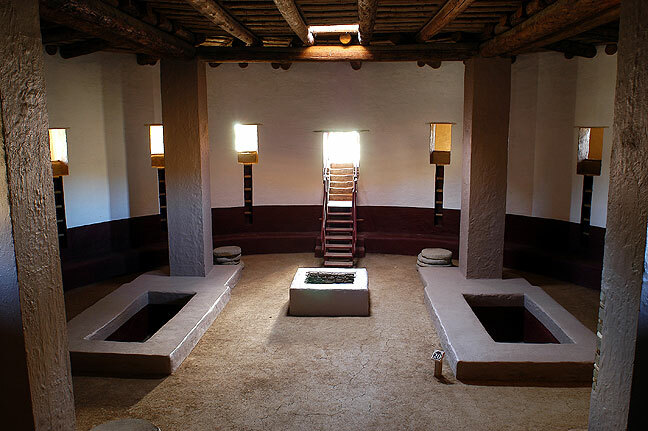 The Tsin Kletsin trail starts at the Casa Rinconada Great House. Your host poses at the Casa Rinconada Great House. 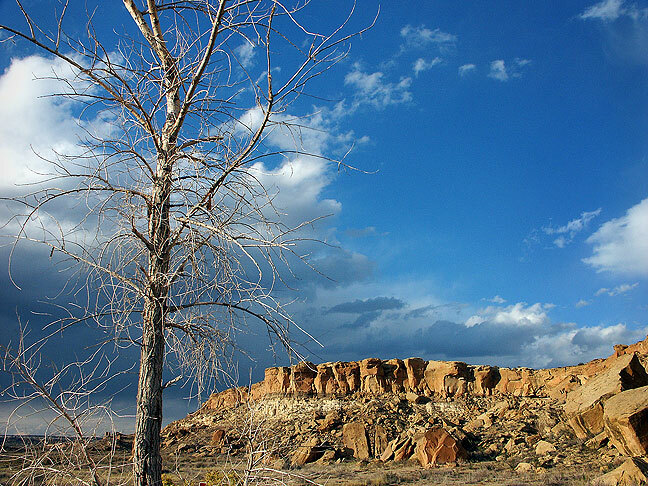 A lone tree juts from the lonely desert landscape on the Tsin Kletsin trail at Chaco Canyon. 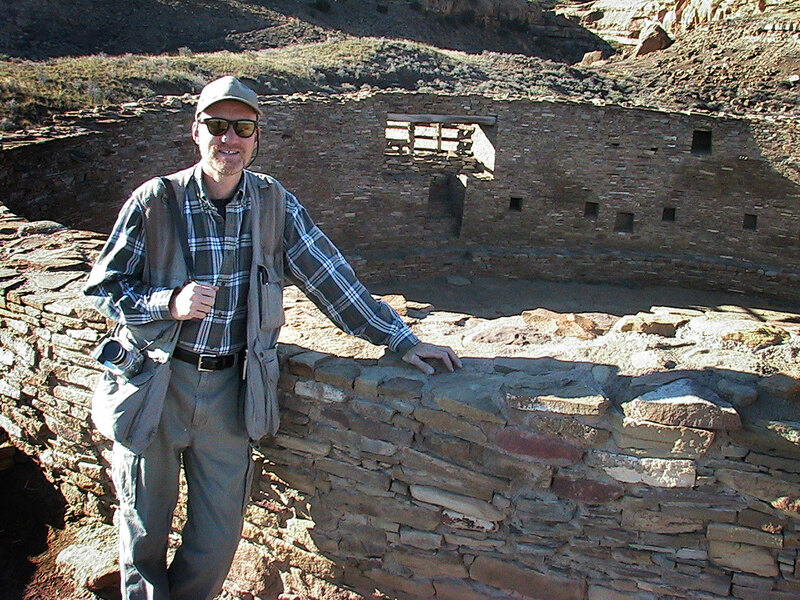 David prowls the partially-excavated ruins of the Tsin Kletsin Great House. 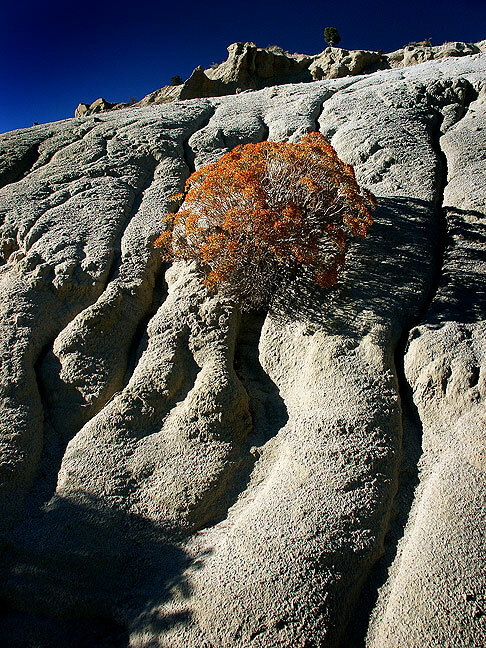 Bright, clear November light shines on this plant on the Tsin Keltsin trail at Chaco Canyon. 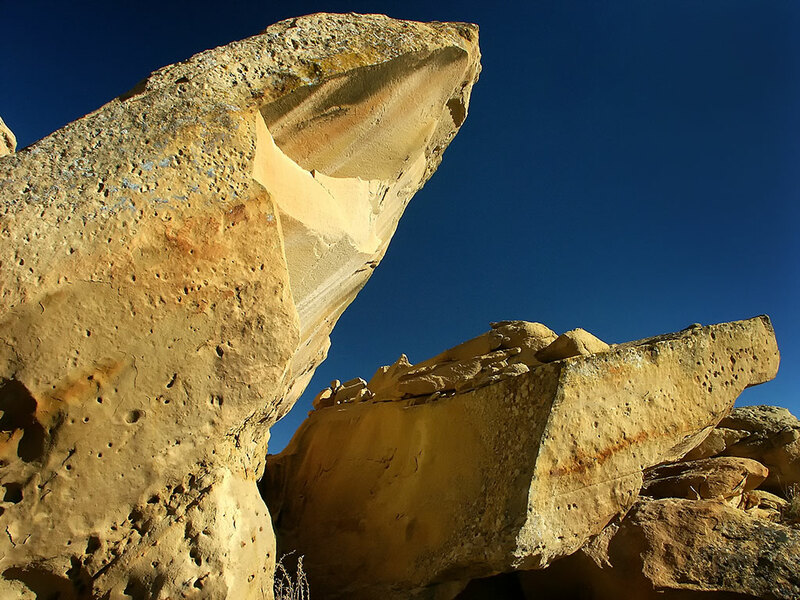 A handsome Cliff House sandstone boulder stands in afternoon sunshine on the Tsin Kletsin trail at Chaco Canyon. 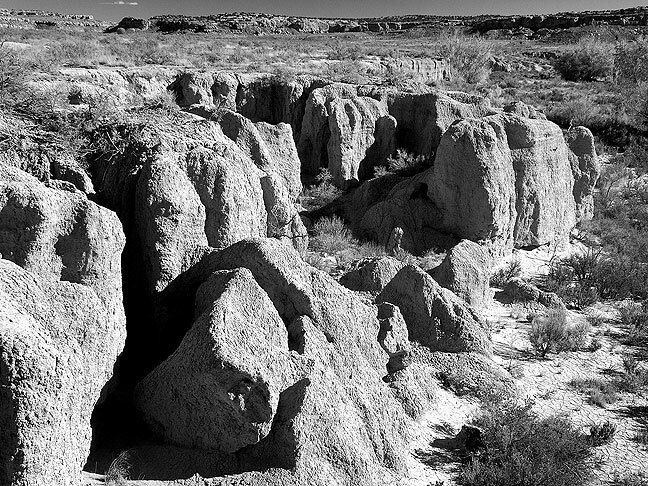 The Tsin Kletsin trail descends from South Mesa into South Gap, forming a lonely, open-desert journey. 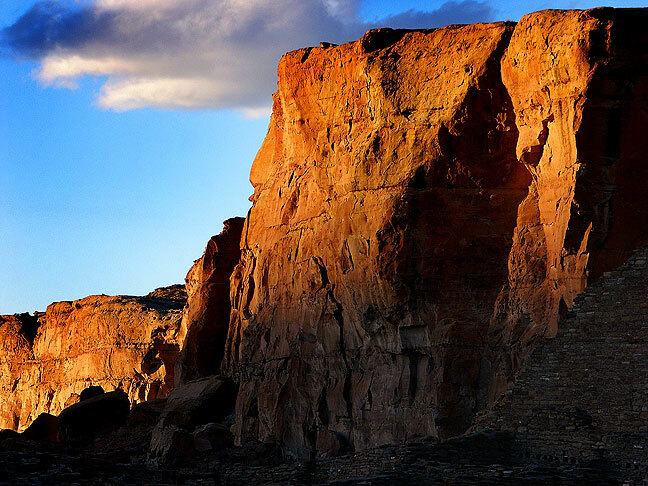 This view shows the wall of South Gap, the canyon that forms the end of the clockwise loop of the Tsin Kletsin trail at Chaco. 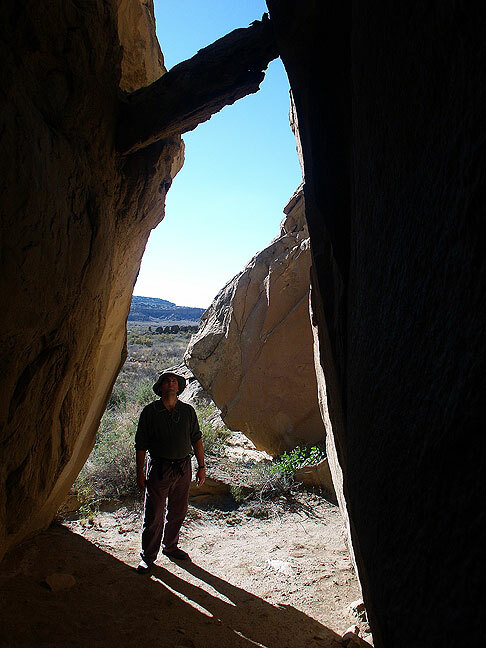 The trail to the Wijiji Great House passes quite close to Chaco Wash.
David stands under a stone in gap on the easternmost trail at Chaco’s Wijiji Great House. 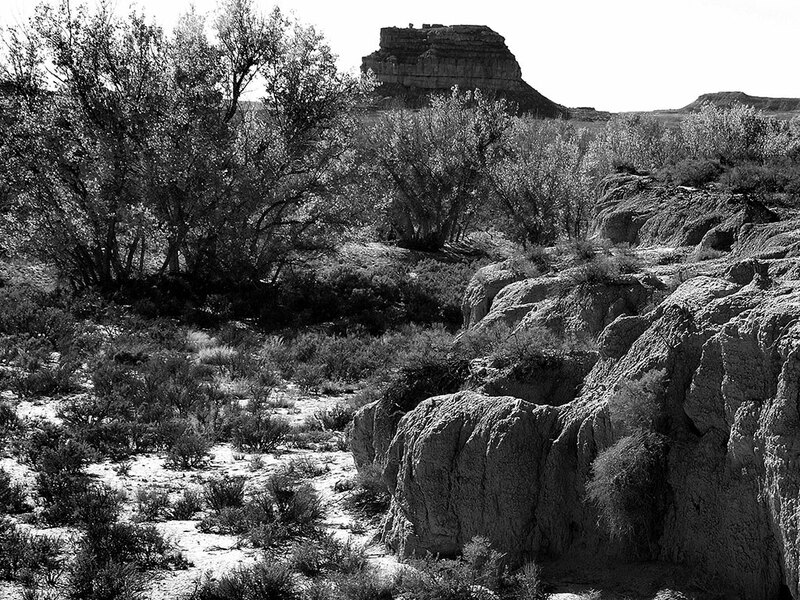 This view from the Wijiji trail shows Chaco Wash and Fajada Butte. 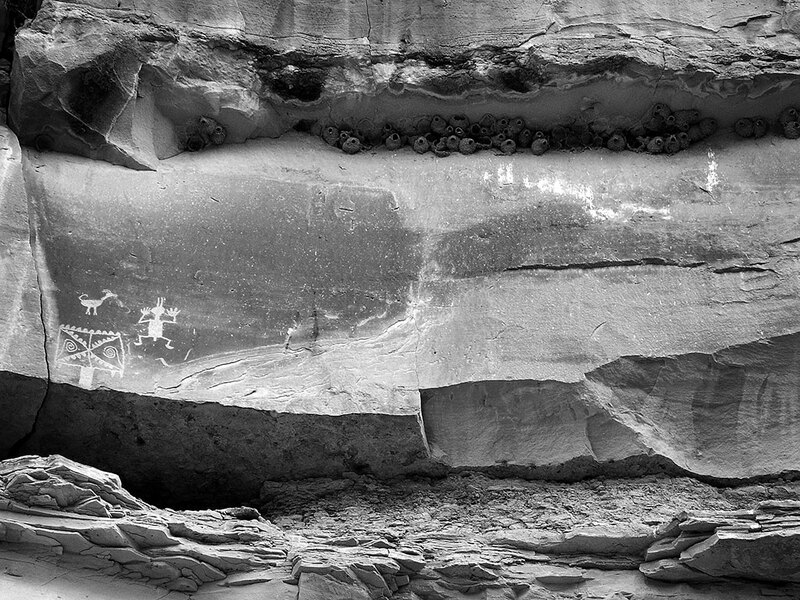 These massive Cliff House Sandstone blocks are common along the Wijiji trail. 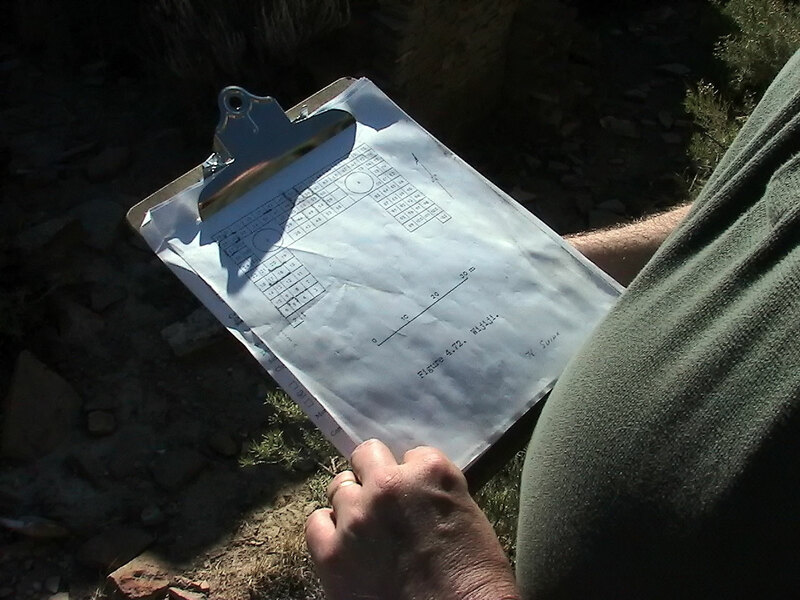 David found this clipboard at Wijiji, which we believed was a Park Service map of the rooms of the Great House. We put it back where we found it. 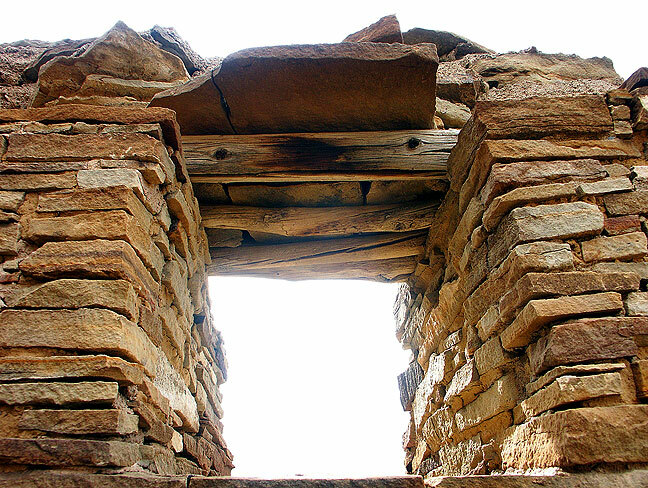 We notes several small arches near the Wijiji Great House. 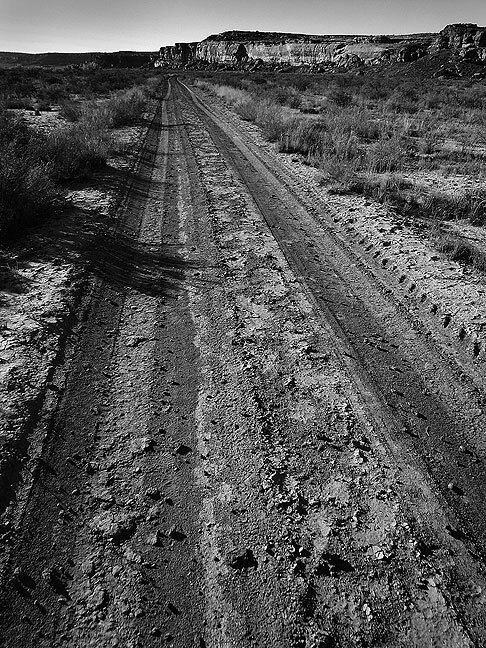 Most of the Wijiji trail follows a service road. 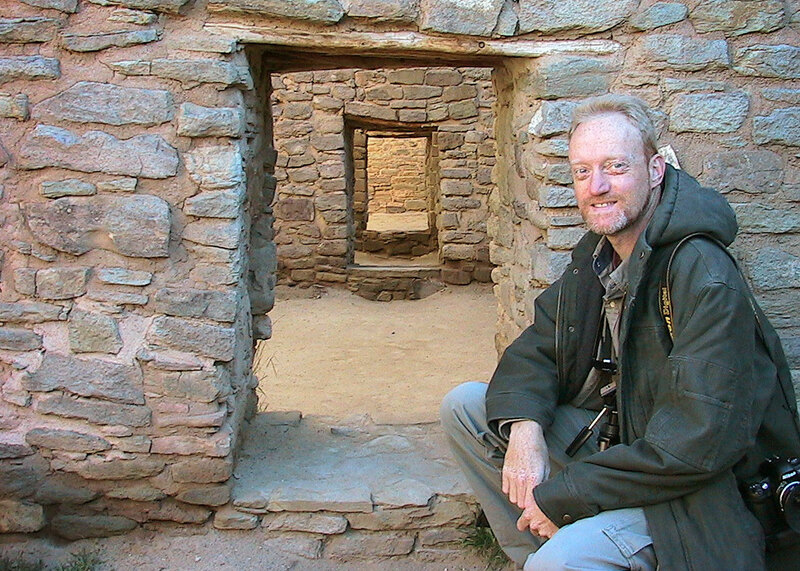 Your host poses at a doorway at Aztec Ruins National Monument. 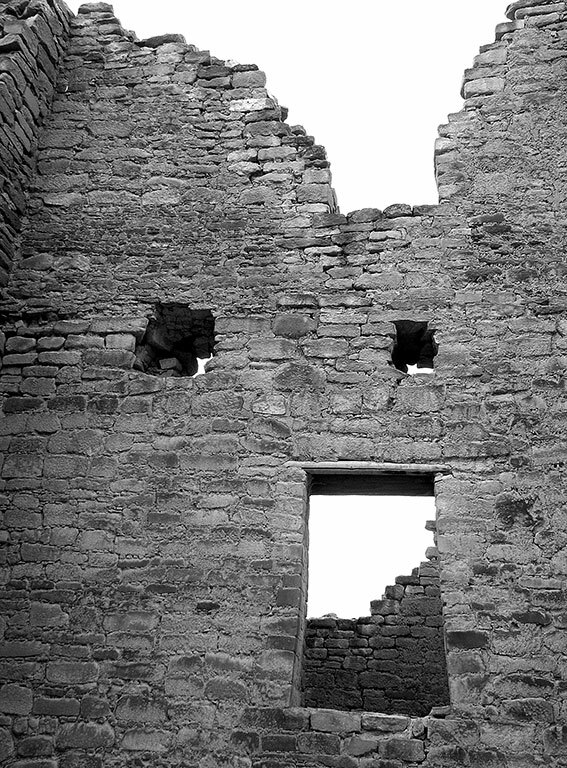 Aztec Ruins National Monument; I shot more and better than I expected, including some interesting black-and-white. 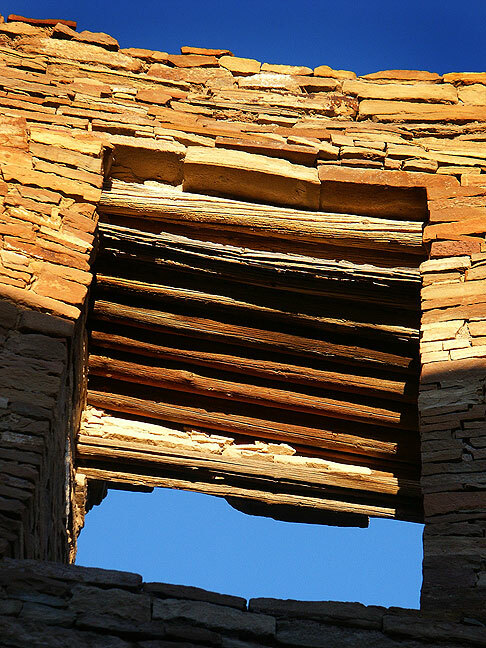 Amidst cold air and blue skies, I shot the cliché view inside the great kiva. 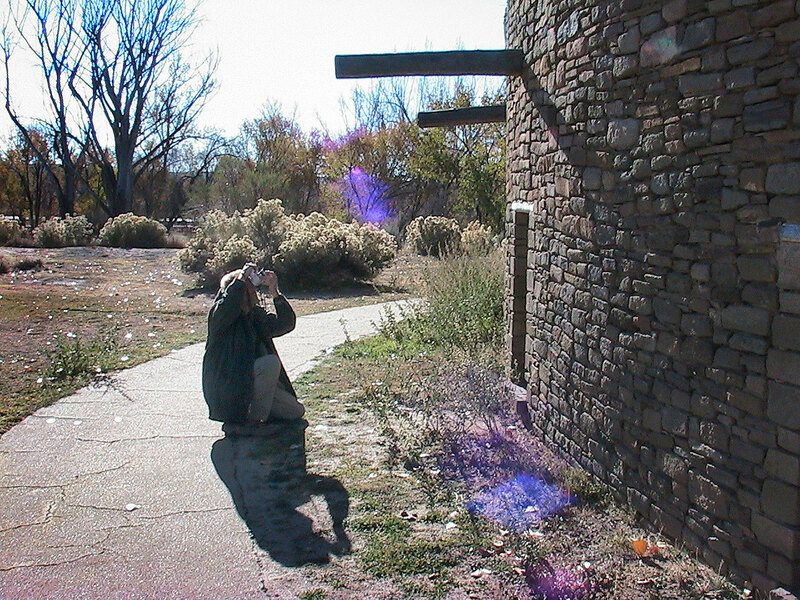 The author makes pictures at Aztec Ruins National Monument on a very cold afternoon. 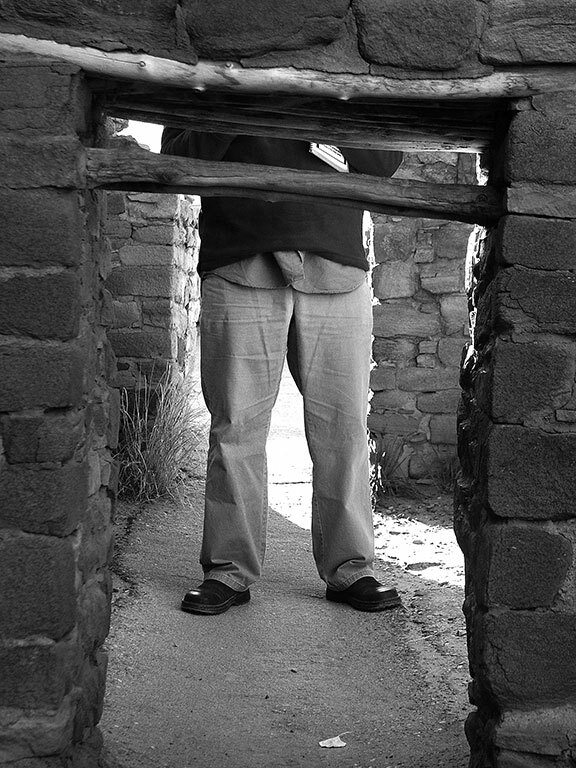 David’s legs appear in doorways as her walks through Aztec Ruins National Monument. 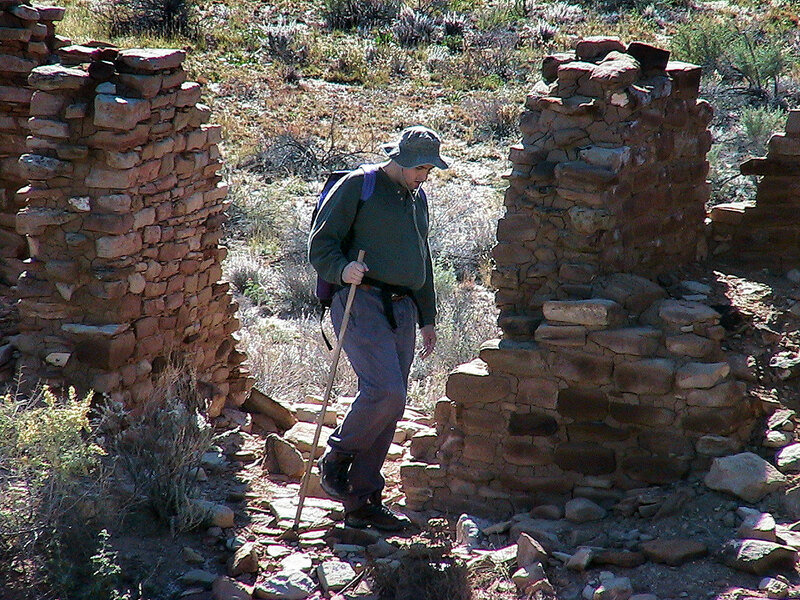 David poses for a photo on a gas well access road at the bottom of the slopes below Angel Peak. We spent the rest of the day at Angel Peak Recreation Area, which we found to be visually very interesting, but lacking in trails and facilities. 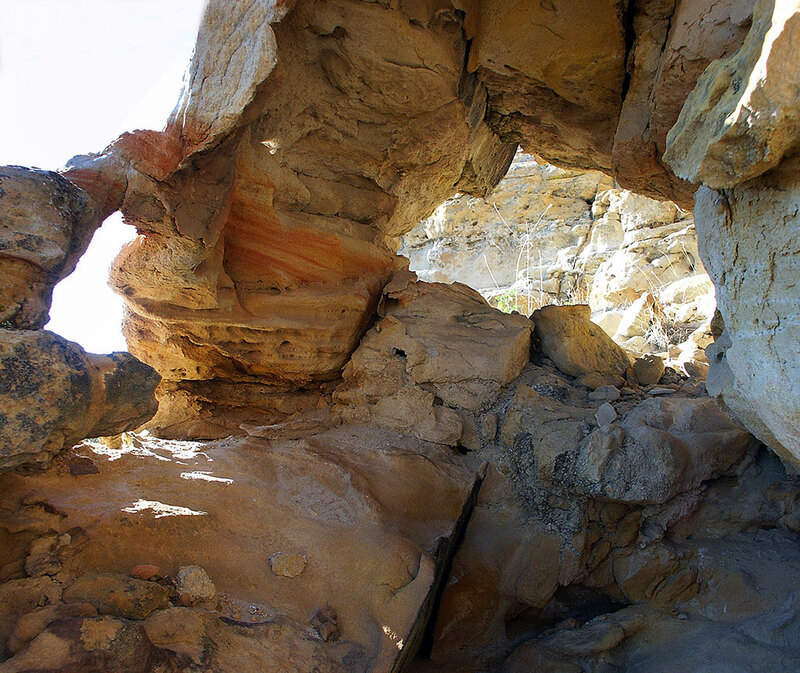 We hiked to the bottom of some canyons and arroyos before positioning ourselves for sunset. 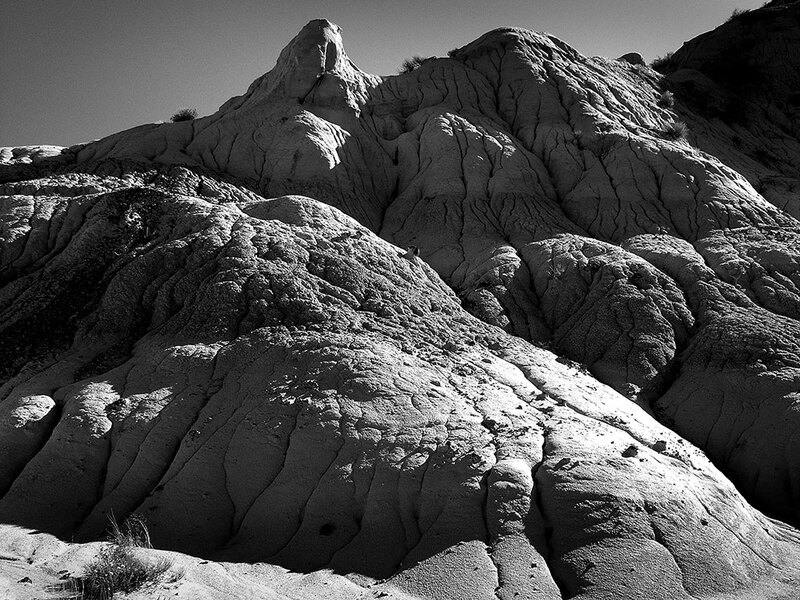 Since we were at the bottom of the basic at Angel Peak during the middle of the day, the formations looked more commanding to me in black and white. 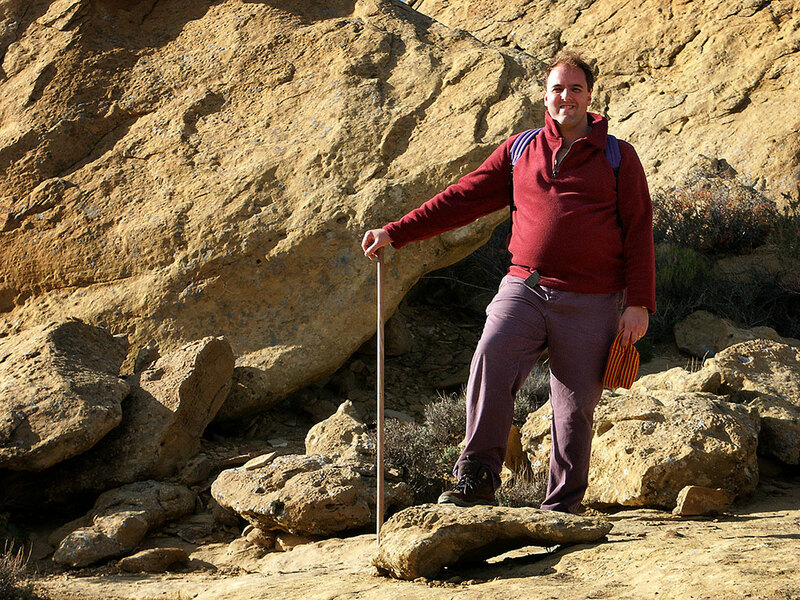 Although there are no marked trails, we hiked some distance amidst the erosions at Angel Peak. 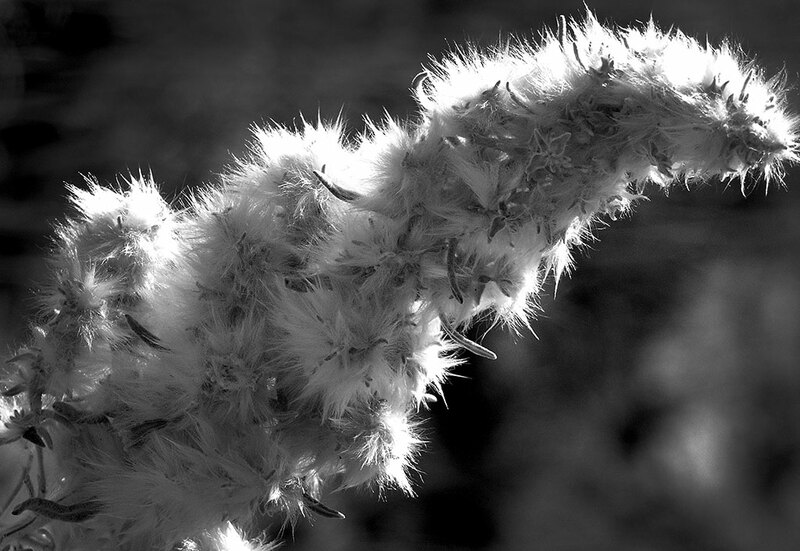 We found the experience hauntingly lonely. 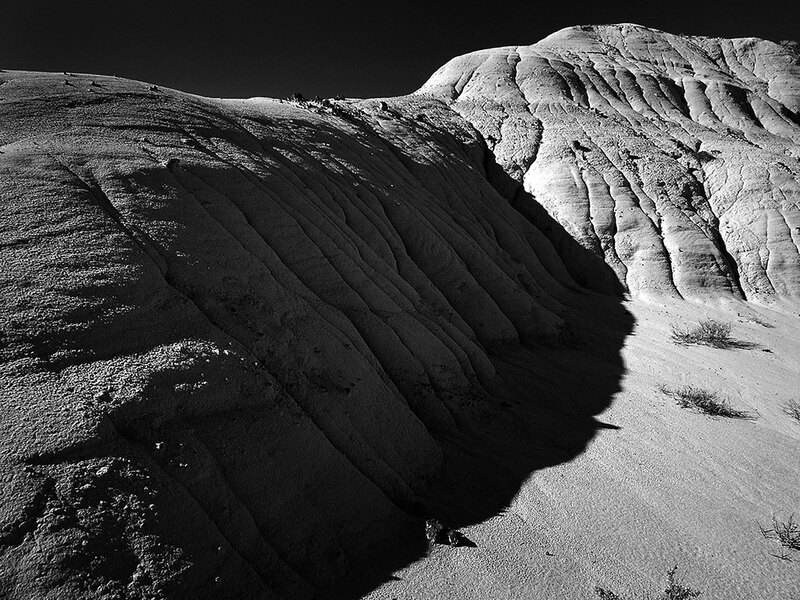 The sky was clear and the light was bright and contrasty as we hiked around the basin below Angel Peak. 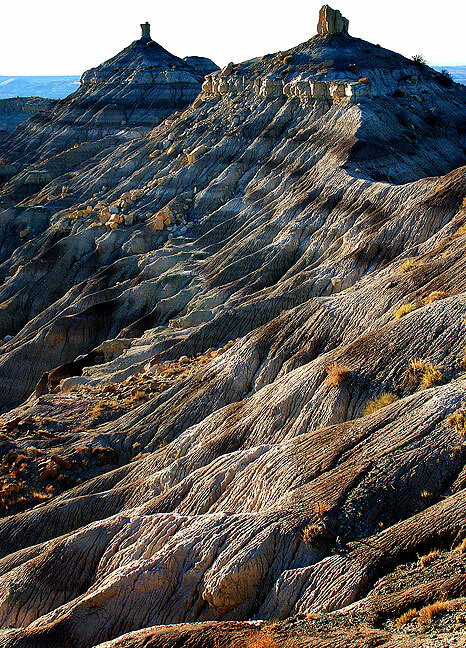 Intricately eroded alkalized soil carved from Kirtland Shale and the Nacimiento Formation stretch to the horizon at Angel Peak National Recreation Area, New Mexico. 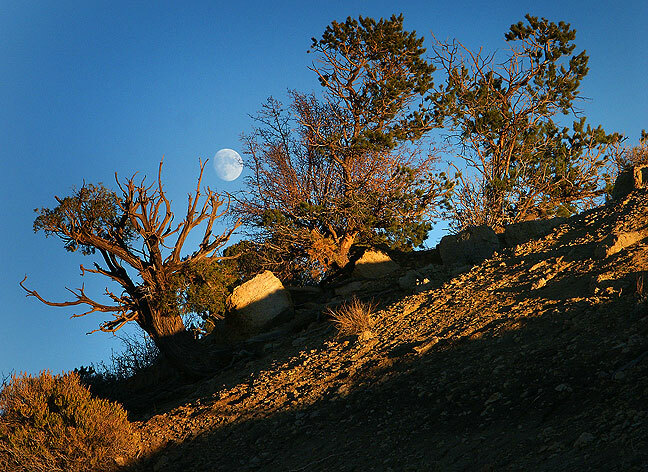 The moon rose behind us as we awaited the golden moment at Angel Peak. 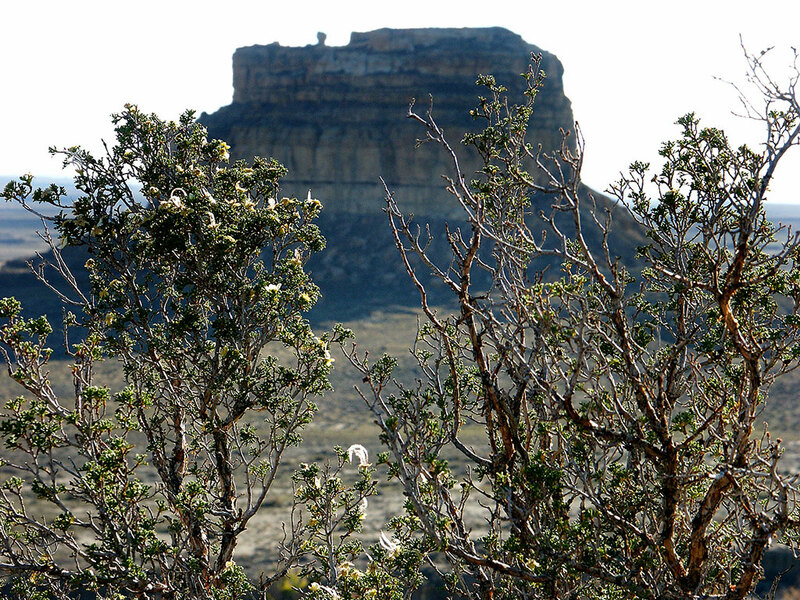 This view of Angel Peak looks west-northwest from atop the ridge. This is another view from the ridge near Angel Peak. 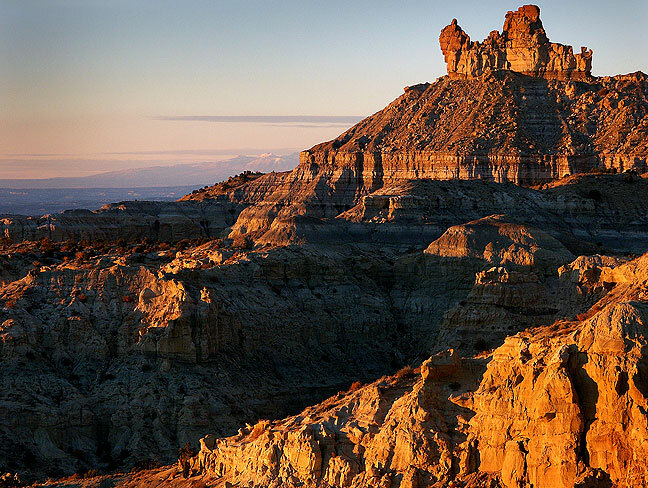 Angel Peak is visible as the peak on the left as sunset approaches. 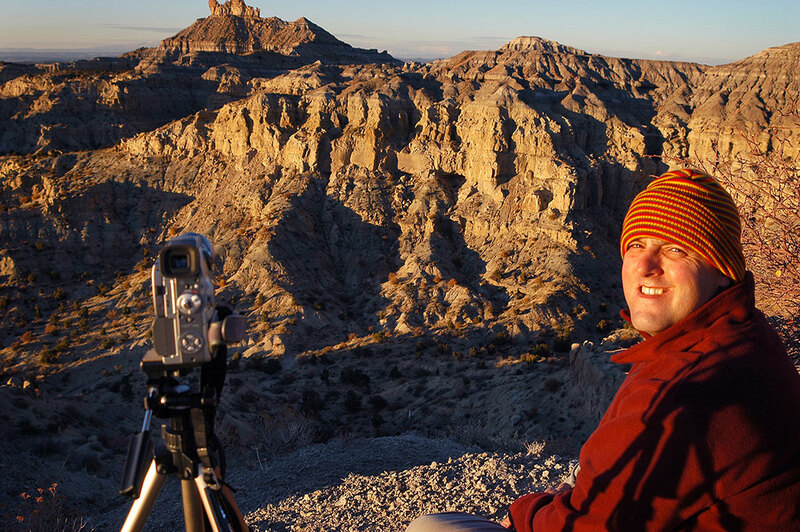 David shows patience with the cold weather as we wait for sunset at Angel Peak. These prominences similar to Angel Peak are just to the east. This tighter view of Angel Peak was made at last light. Years earlier we nicknamed this spot the “Plague Town” because it could be the set for a movie about a plague that destroyed humanity. 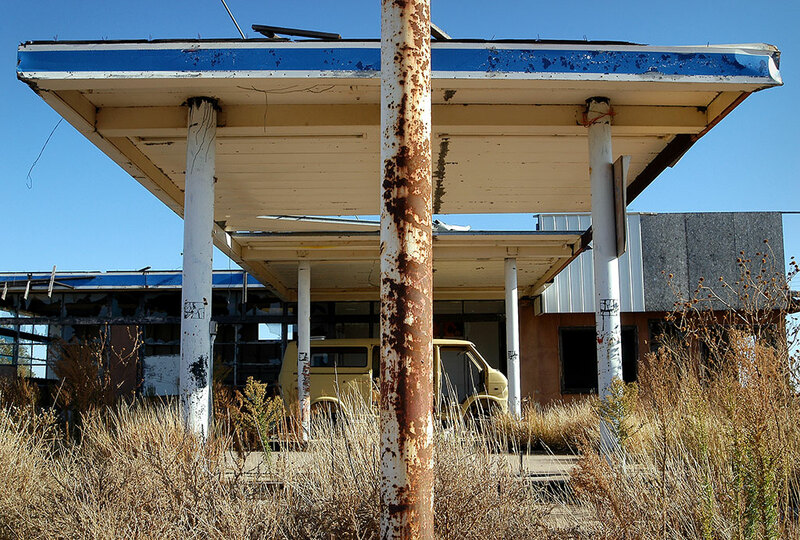 In actuality, it is an abandoned restaurant, gas station and frontier museum. 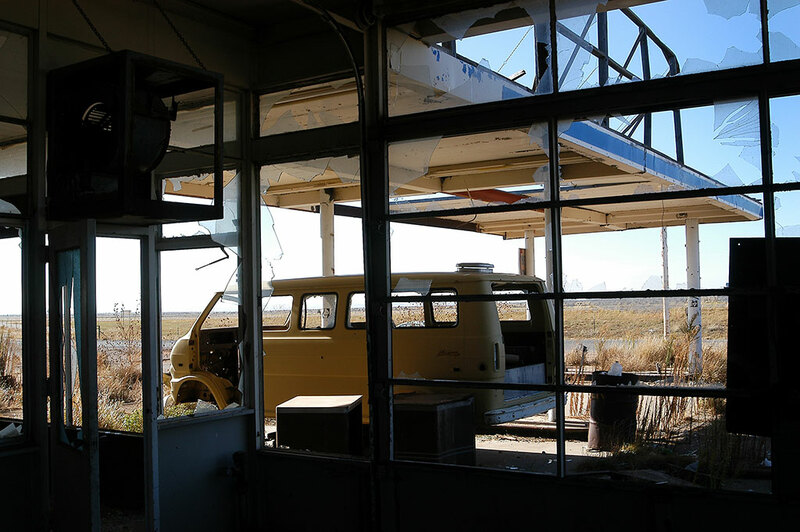 At the “Plague Town,” which is actually an abandoned service station and frontier museum, I made better pictures than the last two visits combined. 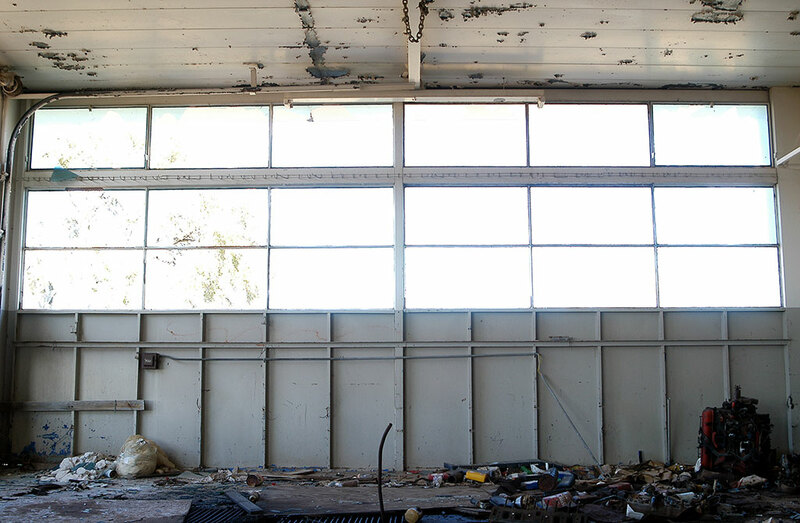 Some windows remained intact, but the mirror in which I shot a self-portrait in 2000 could not be found. 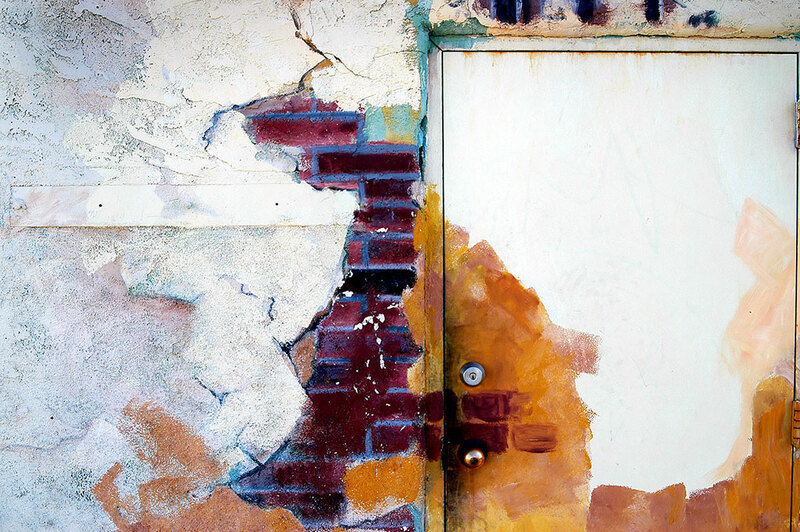 While having lunch in Albuquerque, we spotted and photographed this artistically-rendered wall and door. Odd event, near the New Mexico-Texas border: we saw state troopers stop the entire flow of traffic in the opposite direction on I-40. About five minutes later, they stopped all traffic in our direction of travel. After about 15 minutes, with no explanation, they opened our direction. 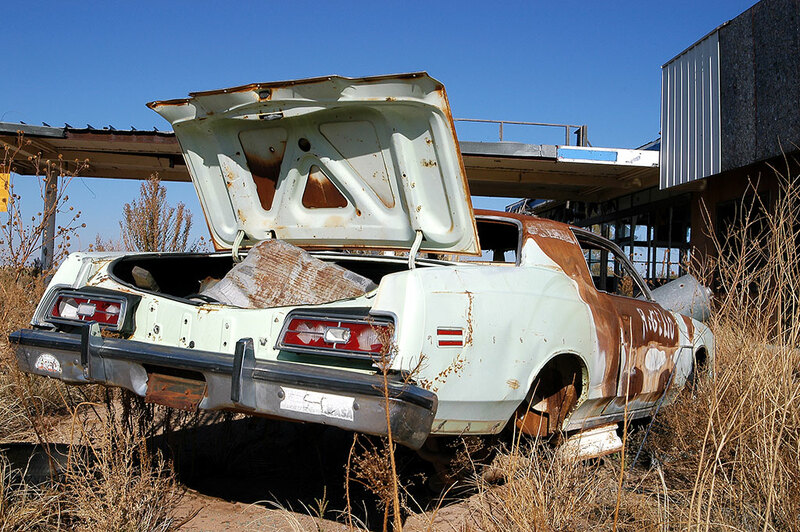 We spotted this mission graveyard south of Farmington, New Mexico. 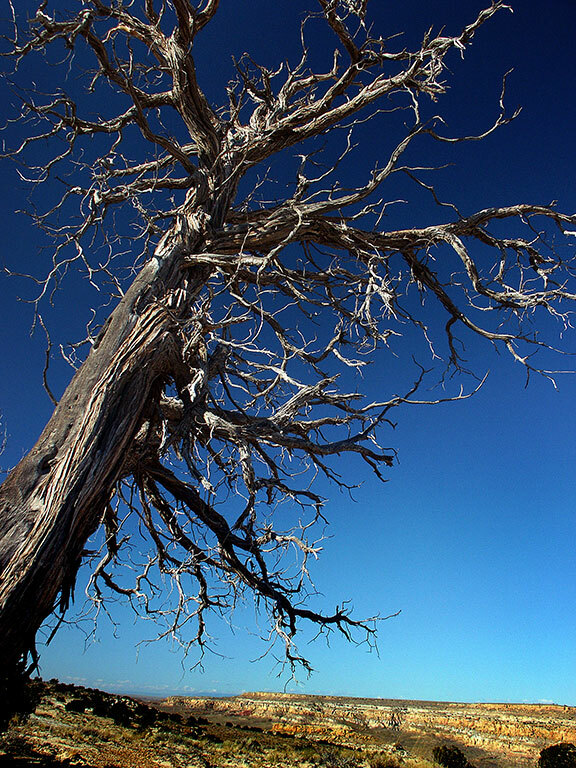 I consider this one of my most successful photographs from the American southwest. I shot this stop sign at the intersection of the Angel Peak road with U.S. 550 near Bloomfield, New Mexico.